Housing to get more expensive in 2012 for First Time Buyers? Surely this couldn’t be? Everybody knows house prices are dropping right? True, but if you are not a cash buyer (and of the increasing stock of cash buyers almost none of them are first time buyers) you’ll need a loan and that is where things get more expensive. This is a good example of the difference between the price of something and the cost of something. The price is what you pay to acquire a good (in our case a house), the cost is the sum of value of inputs into production (in our case the money put into paying for the property). To put that in plain English: the price of a house is one thing, the monthly repayments are the cost and factors of that cost are many, the mortgage, insurances, upkeep, and of course taxation. Mortgage rates have been rising, to the point that the Central Bank has thought it prudent to threaten an intervention if banks increase variable rates. We are of the opinion that borrowing in 2012 will be at higher rates, when there is a scarcity of credit the natural inclination is for price to go up. Insurance prices may rise and fall but are typically not a make or break factor, with some such as mortgage protection normally coming at a fixed price at the outset of the loan. Upkeep is getting cheaper as both materials and tradesmen prices come down. Good old’ evil taxation – but in the case of property purchases for first time buyers it isn’t so evil, in fact it is perhaps too generous, but that is set to drop substantially after this year and end in 2017, its called ‘Tax Relief at Source’ or TRS. Currently you can get up to €10,000 in interest applied at a rate of 25% for the first two years in relief (we’ll give an example of a couple buying together to demonstrate this), this goes to 22.5% for the next two years then 20%, and the scheme ends in 2017. So we’ll hypothetically buy a 3 bed semi for €200,000 today at a 4.4% three year fixed rate over 30 years and a loan amount of €180,000 (90%). We’ll take the same place next year at a price 8% below this and where rates have gone up 0.4% and compare the two costs*. 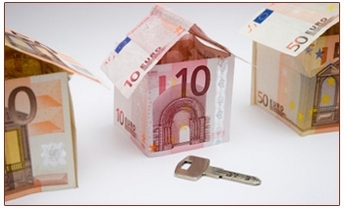 Monthly mortgage: €901 per month. €7920 is your annual interest on this loan, meaning about €660 of your €901 payment doesn’t go towards reducing your debt, it is dead money in a sense. But you do get 25% of this applied as a relief (€1980) or €165 per month. Net cost after TRS = €901 – €165 = €736. So for the first two years the monthly cost will be €736 before insurances and upkeep. Monthly mortgage: €869 per month. can be used to calculate TRS at 15% = €900 a year or a mere €75 per month. And there you have it, a cheaper property that actually costs more every month! This difference in taxation will have a strong impact on cashflow, in the example of a single person buying it is even greater. This is no endorsement to run out and buy a property, but it is notice of an important factor in the difference between price and cost, as well as showing how cost will change a lot between 2011 and 2012 perhaps as much as prices will. We hope you continue to crunch numbers with us, we’ll be here every week through to 2012! *this calculation doesn’t factor in years 3 – 30 because once off the fixed rate future rates apply to both loans and the one with the higher balance will be more expensive (the first property), but to weigh the gain in the near term versus that saving in the future is difficult to model without endless assumptions on inflation and interest rates, as well as creating present values in year 27 – 30 where buyer 2 still has a loan and buyer 1 is mortgage free. What we are doing is making the case for understanding the value of a tax break. Is it fair to track householders to ensure they pay the household charge? @Karl CSO figures have the y/y rate of decline for September at 14.3% and has been in double figures since late 2008(http://www.cso.ie/releasespublications/documents/prices/2011/rppi_sep2011.pdf). Your argument won’t work with the current rate of decline and depends on an unexplained recovery to an 8% decline. @Ronan currently banks don’t factor in TRS into mortgage repayments, but they do (and have for the last 10yrs) stress tested them, so higher margins mean less borrowing ability – but that doesn’t automatically translate into lower house prices as can be seen in the UK when margins rose significantly in the 90’s and they headed into a boom/bust the same as we did. @David There is significant private savings in Ireland, c. 88bn if I recall correctly. The allsops auctions have been almost all cash buyers, you have people inheriting money, getting redundancy, savings, other windfall gains, people who sold houses or land and didn’t buy back in for whatever reason. There is a belief that everybody is suffering in this recession, when in fact it would be fairer to say young people <25yrs old are hardest hit (in terms of unemployment) and after that people in construction & related activities. @ConorKelly we have too much property – that's a given, the supply & release by NAMA is perhaps a key question. I think it is of value to consider the cost of rent versus the cost of financing a purchase, one is not a perfect substitute for the other but if it swings to where buying is cheaper (and if you have an appetite & tenant for 'rent a room' it often is) then there is a financial reason for doing it, the question remains as to whether people actually will or not. I think that the absence of confidence errs on the side of the latter! @Simon if 8% is unrealistic what do you think is a fairer estimation? On the 'savings' argument, you would have to apply a rental comparison on a like for like basis so show your workings and we can debate this one out! Looking forward to it. @Dan Nyhan I don't fully agree with your thinking but am totally on the same page when you indicate the property cycle – although I think that we will actually see prices stop dropping (talking 'non apartment second hand in cities' when I refer to 'the market') sooner than the 20's. @Michael O'Brien, I'm hoping that you have the answers for those questions, I certainly don't! @John on the rate increase: Personally I think they will look for more, but I have to go with figures that don't cause an erratic skew, or it would make buying this year look attractive (if you had a very high rate next year). @Jorge what a good find! I think I'll talk to the folks over in MyHome to see if we can make an irish version. Very interesting article Karl. Can you please address the comments made about it? i noticed you factored in a 0.4% rate increase, with banks chasing profits to recapitalise (i resume there are a lot of taxpayers and some in the government who might secretly advocate this approach), this may be the an optimisticially low interest rate hike? First time buyers should hold off until Nama are forced to release their 8000 apartments onto the market. When the market for housing is allowed to fall to a sustainable level we can then hope for some stability. Not growth just stability. How can this be acceptable.We have bailed out the Banks .They continue to sit on our money and not help SME by releasing credit.How come The banks created this problem,We bailed them out.All stressed loans on Banks Balance Sheet have been recapitolised.Why should we pay 100% to the banks after we paid them to reduce their stressed loans.In a case recently I heard of the bank putting client under considerable stress to pay a loan of 11 million.This loan was on banks books as 2 million,yet they continued to seek payment for 11 million.Are we mad or what? The price/values/variables I suggested above are totally unrealistic – we’re not insane, lol! – they’re prices from the Celtic Pyramid years, not from the Celtic Collapse years. The solution to this is very simple – The loss will be passed onto the seller (not the buyer). This means house prices will take a substantial hit – directly relative to the amount lost in Tax Relief. This also applies to the forthcoming reductions in Rent Relief for landlords. They will have to take the hit, not the tenant. Myself and my partner will be buying toward the end of the next 12 months. We have a certain repayment maximum figure agreed. Anyone planning buy a house today and have children in the future would be wise to do the same! The market will stop crashing next year, but will continue to slowly sink for a decade while taxes increase before they rebound rapidly in the early 20s. Assume that repayment figure is €900. Pre-2012, we could afford a mortgage of €1,000 per month (900 + 100 relief). So the person who hopes we will buy their house, either accepts a (12 x €100) x (25 years) = €30,000 reduction in the selling price…………or we just continue to save and wait until the prices have collapsed some more. It’s a buyer’s market, not a seller’s market, and will continue to be for the next 10 years. In addition an 8% fall is unrealistic. Well, there are plenty of vacant houses and apartments and they arent going to be swallowed up by this time next year so we can be sure that prices of the properties are going to have to keep dropping to enice newbies into the market at a rate they can afford to repay. Also interest rates are going to have go alot higher soon to fight inflation. I wouldnt be jumping into anything just yet. Is there really an increasing stock of cash buyers? All things being equal banks will take the change in TRS into the equation when giving out mortgages. This will mean lower mortgages being given out and so lower house prices. This will be an additional factor which should see the prices of houses fall more and the “cost”stay static. What about costs of renovation – any movement on VAT rates that would be more favourable to renovations?